Big Bazaar is the largest chain of hypermarket in India.Big Bazaar promises more for less, addressing a wider range of product lines which are of interest to mass market. 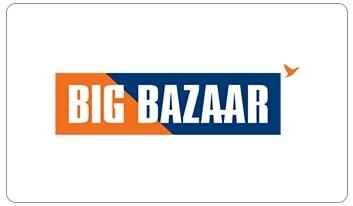 Big Bazaar was launched in September, 2001 with the opening of its first four stores in Calcutta, Indore, Bangalore and Hyderabad in 22 days. Within a span of ten years, there are now 161 Big Bazaar stores in 90 cities and towns across India. Big Bazaar gift vouchers offers a wide range of apparel and accessories, baby accessories, dress material, suiting and shirting, sarees and much more and all these at a discount. Truly - "Is Se Sasta Aur Accha Kahin Nahin!!"